We have recently updated Bitrix24 Open Channels. Clients relying on our solution for live chat and social media management now have even more tools at their disposal. 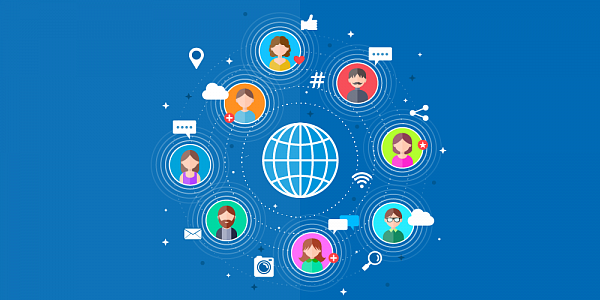 If you receive a large volume of incoming inquiries and employ multiple live chat agents, you can now distribute new messages simultaneously to everybody, much like it works with Bitrix24 telephony. 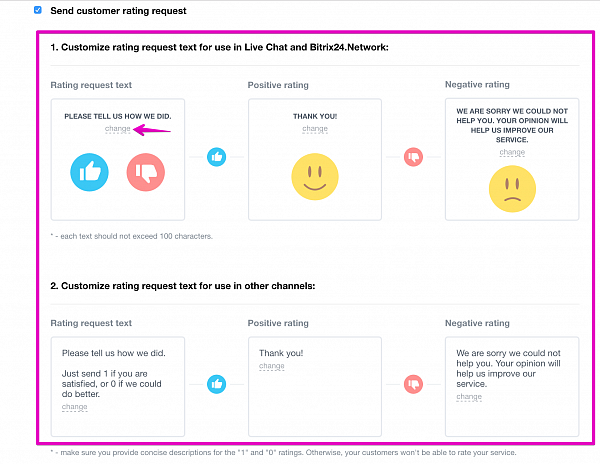 This means than every Bitrix24 agent who’s online will receive notification about new chat session, but only the first one to respond will carry on with the conversation. This distribution method is specially designed for companies who put emphasis on speed of reaction. You need to have Bitrix24 Plus plan or above to take advantage of this feature. 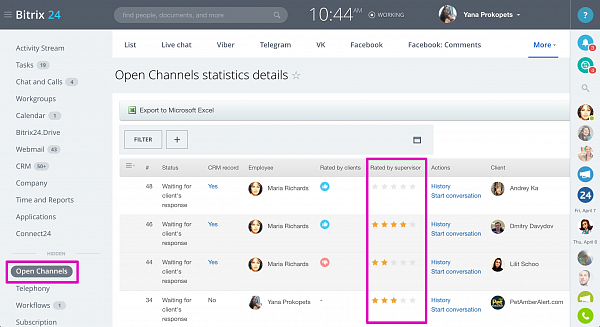 Clients are now able to rate conversations (chat sessions) by either upvoting or downvoting. This feedback mechanism allows companies to quickly identify agents who provide poor service and fix the problem before it gets big. You need to have Bitrix24 Plus plan or above to take advantage of this feature. 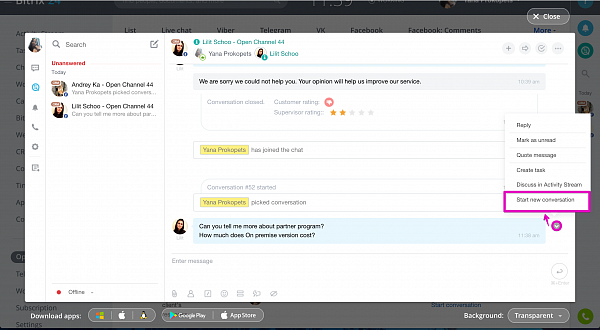 This option is very similar to the previous one, but the feedback is provided by the supervisor and is based on a five-star system. Because in Bitrix24 supervisors have access to all chat sessions, they are able to rate conversations by other agents for accuracy, speed and helpfulness. You need to have Bitrix24 Standard plan or above to take advantage of this feature. 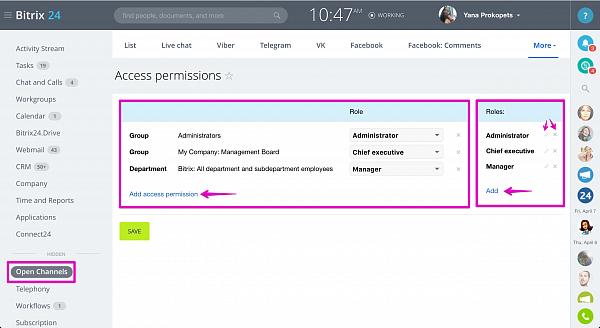 You are now able to set custom access rights for Bitrix24 Open Channels much like you do in CRM. 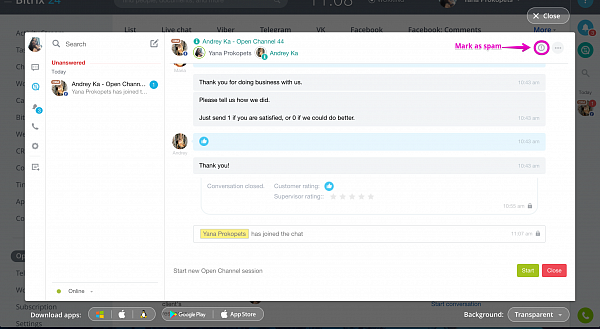 The access permission system is role-based and lets you decide who can access Open Channels in general, specific conversations, change settings, access history, rate conversations or view statistics. You need to have Bitrix24 Standard plan or above to take advantage of this feature. Unsolicited or undesired Open Channel conversations can be now marked as spam. This can be done both before and after you have started the conversation. This option is available for all Bitrix24 plans, including the Free one. When your communicate with the same client whose enquiries are related to different subjects, you can now create a new conversation with the same customer & close the current one. It may be quite handy if you take control of open channels ratings and analyze your sales team productivity results. The option is available inside Open Channel dialog.